Among the many discouraging consequences of the country’s economic crisis is the increasing borrowing by the Federal Government to meet its obligations. The borrowing from the domestic market between January and June this year, to augment shortfalls in revenue caused by multiple economic challenges, has hit N600 billion, according to the nation’s financial authorities. The amount is 33 percent of the N1.8 trillion domestic and external borrowing provided for in the N6.1trn 2016 budget. The government now has only N300bn left to hit its domestic borrowing limit of N900 billion approved in the budget. The N600bn already borrowed in six months is contained in government’s proposed Medium Term Expenditure Framework for 2017–2019. The framework, which will be submitted to the National Assembly in October, provides the basis for annual budget planning. It also consists of a macroeconomic framework that indicates fiscal targets, estimates, revenues and expenditure, including government’s financial obligations in the medium term. According to the Minister of Budget and National Planning, Sen. Udo Udoma, the borrowing sadly reflects poor revenue output, due to global oil prices that have negatively impacted on domestic development. This is also in addition to the decline in non-oil revenue, against the projected forecast in the budget. Consequently, there has been a gross shortfall in revenue accruing into the Federation Account. 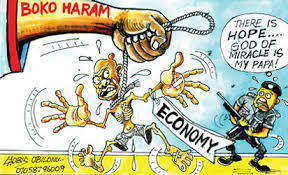 Besides the N600bn domestic borrowing, government says it has almost concluded plans for $1bn Eurobonds borrowing from the International Capital Market to fund the 2016 budget, as inflation, sluggish growth and other challenges bite Nigerians harder. Foreign Direct Investments (FDIs) have also sharply declined, according to figures released two weeks ago. In this regard, the Debt Management Office says it is seeking two lead managers and a financial adviser to organise the issuance of $1bn Eurobonds this year. Eurobonds are financial instruments issued in one country’s currency and sold in a different country. It provides flexibility and helps multinational companies finance global operations in foreign countries. The sale will be the first tranche of the Federal Government’s $4.5bn Global Medium Term Notes Issuance Programme that will run through 2018. Nigeria is, perhaps, facing its worst economic crisis since the commencement of the present democratic dispensation. We are not oblivious of the fact that our economy is bleeding, with every sector under intense pressure from forex shortages, input costs and weak consumer purchasing power, which have dimmed earnings outlook and forced many companies into heavy losses. This is a time that calls for cautious borrowing, prudent expenditure and investment in productive sectors that can justify the amount borrowed. Failure to heed this time-tested wisdom of borrowing cautiously and spending prudently might worsen Nigeria’s already terrible macroeconomic outlook. The beginning of wisdom is for government’s economic managers to reflect on what led to our present economic predicament and chart the way forward. Our problem is traceable to the failure of successive governments to prudently manage our huge earnings during the oil boom days, and keep down the cost of governance. Today, oil prices have dipped so sharply and crude oil production has declined significantly as a result of the crisis in the Niger Delta. Although we find nothing wrong with borrowing, what is vital is to invest the loans in areas that can yield dividends and stimulate the economy. Even though the borrowing ratio to our Gross Domestic Product (GDP) is still within acceptable international threshold, our worry is the revolting culture of financial indiscipline by government officials, especially our politicians. This has resulted in the current rise in Nigeria’s debt stock. We reiterate that there is no shortcut out of our present economic predicament. The way forward is for government to see the bigger picture and frontally marshal an economic emergency plan, with short, medium and long-term goals that will bring solutions to specific economic problems. This is not a time for the one-fits-all strategy. A multi-sectoral approach is what we need. Nigeria recently lost its position as Africa’s largest economy by GDP to South Africa. This is no surprise, considering the manifold macroeconomic challenges, high unemployment, inflation, high interest rates, energy crisis, etc, that have culminated in a recession. This is time to put all hands to the plough, deepen our economic diversification efforts, ensure prudent management of our resources, plug all leakages and prioritise projects that have direct bearing on the welfare of the people and the overall development of the country.